Container orchestration is fast evolving and Kubernetes and Docker Swarm are the two major players in this field. Both Kubernetes and Docker Swarm are important tools that are used to deploy containers inside a cluster. Kubernetes and Docker Swarm have carved respectable niches for themselves, cementing their places in the Docker ecosystem. Let’s briefly look into Kubernetes and Docker Swarm before moving onto see what are the differences between these two container orchestration tools. We covered the basics on Kubernetes in a previous post. You can read it here if you need a more in depth overview of the platform. In Kubernetes, an application can be deployed using a combination of pods, deployments, and services (or micro-services). Whereas, in Docker Swarm, applications can be deployed as services (or micro-services) in a Swarm cluster. YAML files can be used to specify multi-container. Moreover, Docker Compose can deploy the app. In Kubernetes, installation is manual and it takes serious planning to make Kubernetes up and running. Installation instructions differ from OS to OS provider to provider. Cluster configuration like IP addresses of a node or which node takes what role is needed to know in advance in Kubernetes. Whereas; Docker Swarm is simple to install as compared to Kubernetes. With Docker, only one set of tools are required to learn to build upon environment and configuration. Docker Swarm also provides flexibility by allowing any new node to join an existing cluster as either a manager or a worker. It requires knowing CLI (Command Line Interface) to run Kubernetes on top of Docker. You should know Docker CLI to navigate within a structure and then supplemental Kubernetes common language infrastructure to run for those programs. Since Docker Swarm is a tool of Docker, same common language is used to navigate within a structure. This provides variability and speed to this tool and gives Docker a significant usability edge. Docker Swarm is supported for only monitoring with the third party applications. It is recommended to use Docker with Reimann for monitoring, however since Docker Swarm has an open API, it makes easier to connect with plenty of apps. Kubernetes is more of an all-in-one framework for distributed systems. It is a complex system as it offers a unified set of APIs and strong guarantees about the cluster state, which slows down container deployment and scaling. As compared to Kubernetes, Docker Swarm can deploy containers faster; this allows fast reaction times to scale on demand. In Kubernetes, all pods are distributed among nodes and this provides high availability by tolerating application failure. In Kubernetes, load-balancing services detect unhealthy pods and remove them, this supports high availability. Docker Swarm also provides high availability as services can be replicated in Swarm nodes. In Docker Swarm, Swarm manager nodes are responsible for the whole cluster and manage the resources of worker nodes. Kubernetes network is flat, as it enables all pods to communicate with one another. In Kubernetes, the model requires two CIDRs. The first one requires pods to get an IP address, the other is for services. In a Docker Swarm, a node joining a cluster creates an overlay network of services that span all of the hosts in the Swarm and a host only Docker bridge network for containers. In Docker Swarm, users have the option to encrypt container data traffic when creating an overlay network by on their own. Kubernetes is backed by the Cloud Native Computing Foundation (CNCF). Kubernetes have an impressively huge community among container orchestration tools. Over 50,000 commits and 1200 contributors. Kubernetes is an open source and modular tool that works with any OS. When doing it yourself, Kubernetes installation can be quite complex with steep learning curve. An option to solve this issue is to opt for a managed Kubernetes-as-a-service such as ours. In Kubernetes, it is required to have a separate set of tools for management, including kubectl CLI. Docker Swarm is a lightweight installation. It is simpler to deploy and Swarm mode is included in the Docker engine. Docker Swarm has an easier learning curve. Docker Swarm smoothly integrates with Docker Compose and Docker CLI. That’s because these are native Docker tools. Most of the Docker CLI commands will work with Swarm. Docker Swarm provides limited functionality. In Docker Swarm, services can be scaled manually. 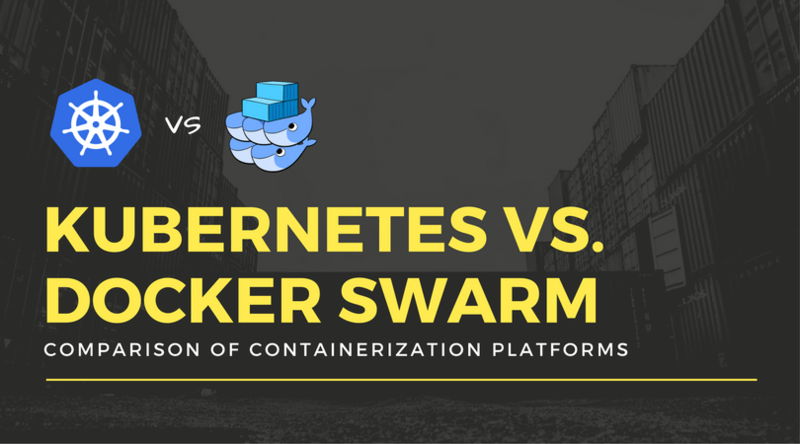 It’s not exactly easy to compare Kubernetes with Docker Swarm as Docker Swarm is a simple and easy solution to work with whereas Kubernetes is targeted those who require full fledge support with higher complexity. Docker Swarm is preferred in environments where simplicity and fast development is favored. Whereas Kubernetes is suitable for environments where medium to large clusters are running complex applications.